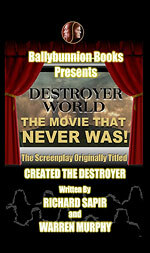 Originally titled Created The Destroyer, this is the original screenplay written by Warren Murphy and Richard Sapir. It's refreshing to see their name together in print again, and it's great to see their unique style applied to the screen adaptation of their books. Nobody knows how to do a 'Destroyer' movie better than the creators!